India lost about 5,550 sq km of forest cover in the last two years. According to the State of Forest Report 1997, brought out by the ministry of environment and forests, forest cover has gone down from 638,879 sq km in 1995 to 633,397 sq km in 1997. 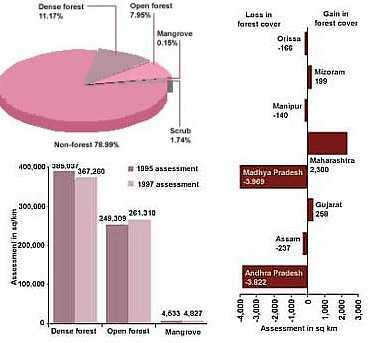 Of the total of 3,969 sq km forest lost in Madhya Pradesh, deforestation in the tribal areas accounted for about 2,186 sq km. And in Andhra Pradesh, about 3,455 sq km of forests in tribal areas areas were lost. The trend of forest loss continues in the Northeast as well, with Assam losing 237 sq km -- about one per cent of its forests.